This space has been silent for a few days. Even though I have a number of recipes in my drafts to be shared, I could not bring myself to compose a post. Plain lazy, I have been. Today's recipe comes from Miss Masala- a Cookbook by Mallika Basu. I had reviewed it a few days back after trying a couple of recipes from it. Bhapa Doi/Misti Doi is a popular Bengali delicacy. 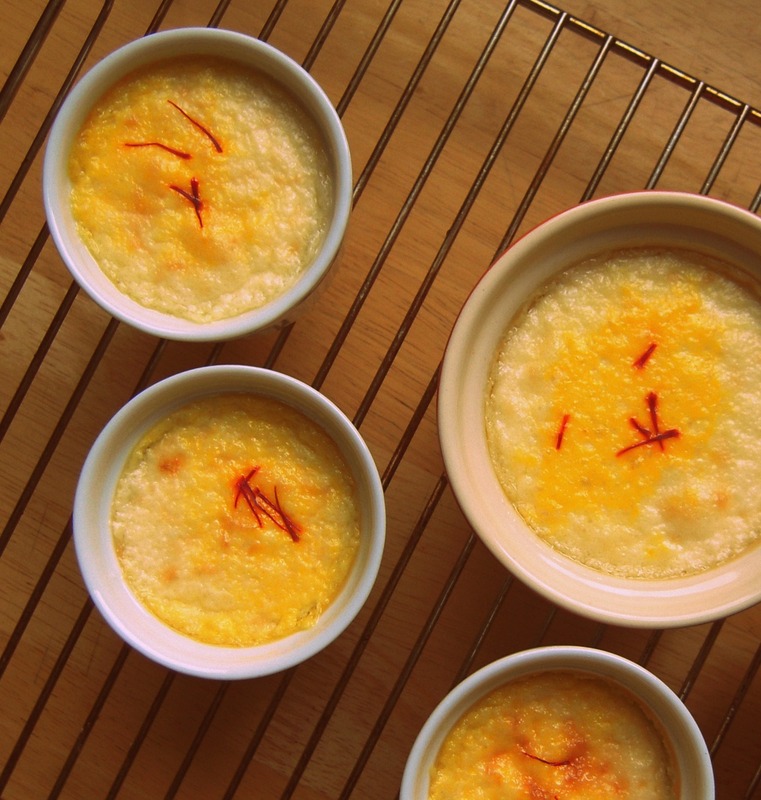 It is basically steam sweet yogurt and it often called the Indian cheese cake because of its texture. The traditional recipe can be quite time consuming at it involves thickening the milk by slowly cooking it, setting the yoghurt and then steaming it. 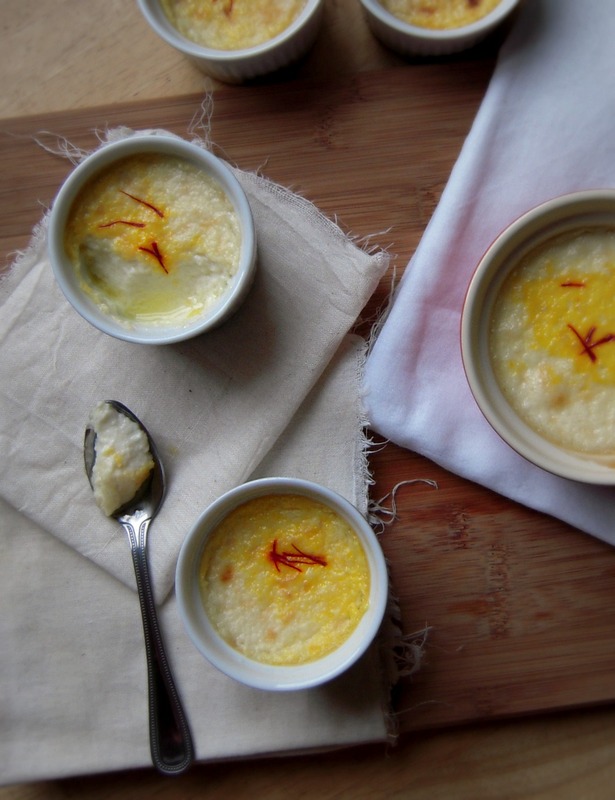 Mallika however provides us with a quicker recipe. You will be amazed by the simplicity of the recipe. 2. Soak the saffron in the milk. Powder the cardamom finely. 3. Beat the yogurt and condensed milk together until smooth and add the powdered cardamom. 4. Fill this mixture into ramekins or a baking dish. Place them in a large baking tray. Fill the tray with enough hot water to come halfway up the sides of the ramekins or dish. Bake in the oven for 10 minutes. 5. Spoon the saffron mixture over it and bake it for another 5 minutes. If you are using a large baking dish, it may take longer. The yogurt mixture should appear set. Cool to room temperature and then refrigerate. Serve chilled. Once it is chilled, it sets a little more. Note: I had over baked it by 10 minutes then what is stated above and the result was nice and firm set yogurt. If you want it less firm, change the baking time accordingly. None the less it will taste good. 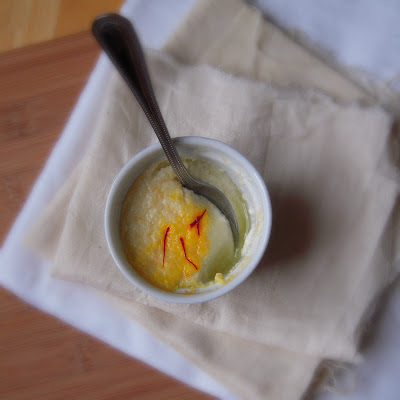 I will be up with a quick kulfi recipe I had tried from Mallika Basu's Book - Quick Indian Cooking, next. Stay tuned. Thank you for stopping by! Cheers! wow very nice and awesome presentation and pics...btb hv aqn..i don't see any yogurt in the ingredients...but u hv mentioned it in ur method.....ca you pls clear my doubt? Thanks for pointing out the mistake Anu. I have updated the recipe. You make it look so tempting, and I'm not even a fan of misti doi. The hubby is though, so I might just have to make it for him sometime since we don't get nice misti doi in dubai. Thanks for sharing. Jyoti, thanks for the link and a reminder that I need to make this again! I haven't made mishti doi or bhapa doi using condensed milk. I just worry that it might be too sweet. You make itr look so good! I am so gonna try out this recipe. Looks so mouthwatering and tempting! Dear Jyoti, made this recipe today with some variation and just posted it - and it turned out great! Thanks for the inspiration! Wordless Wednesday ~ Spring is here!